Other photos on file from 1986 and 1980, including a barn. 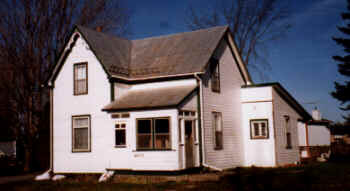 This Main Street house was built in 1913 by Allen Brown. A North Gower native, Mr. Brown had gone west after the c. 1900 death of his wife and had helped to build some houses in Nanton, Alberta. He returned to North Gower by 1913 and is buried at Merrickville. 'This home was built for his aging parents and for this reason the bedrooms were originally on the ground floor along with the living and dining room. Brown appears to have bought the property in 1913 from James Gallagher and sold it six years later to John Seabrook Jr. for $1,650. In 1945 Mr. and Mrs. Armstrong bought the house from Mrs. Henry Seabrook and in 1985 the estate of Mrs. Armstrong sold it to Claire Flowers. The house has a basement only four feet in depth and a building in the backyard which once housed pigs, poultry and a cow. Prior to 1927, a windmill-powered "Delco" system charged batteries to provide for the home's electrical needs. This was replaced with regular electricity in 1927. Plumbing was installed in 1953.